What can you expect in Skopje? 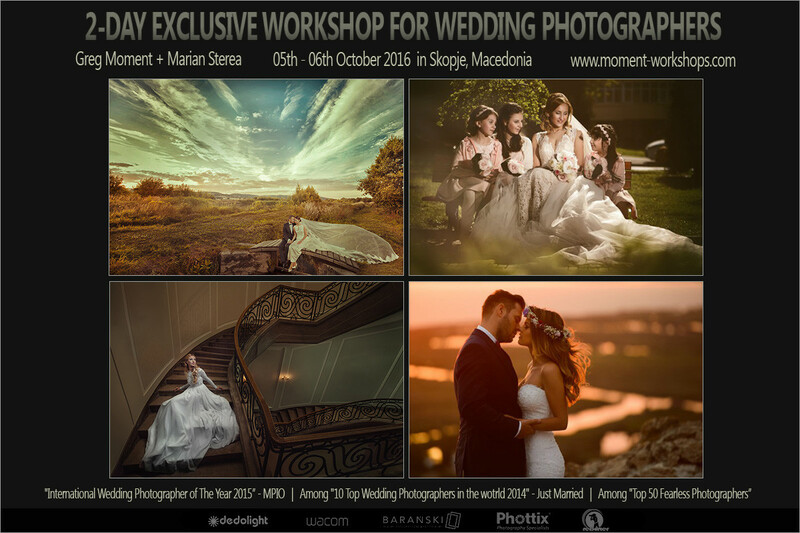 This time Greg Moment (www.moment.com.pl) provides two-day-long workshops for wedding photographers in Skopje, Macedonia together with Marian Sterea from Romania. Marian is listed amog "Top 50 Fearless Photographers" in 2013 and the Winner of grand finale of Nikon Romania Calendar 2012. He also received many Awards of WPPI and Excellence Awards of "Wedding Photography Select". Together with Greg Moment, Marian run their first workshops together in Romania in 2015 with the full group of students and lovers of wedding photography. ► You will see how Greg Moment and Marian Sterea create vision and style in Capture One and Photoshop at the end. 10:00 am – 06:00 pm. Regular fee: 250 EUR. Group 10-15 photographers. Early birds: 200 EUR!!! (paid before 25.09.2016. - the deadline has been extended!). 100 EUR deposit is required to reserve a seat. Way of payment: Paypal or bank transfer (payment to the account in Macedonia). If you have any problems with Paypal or bank transfer – contact us to find the most convenient way of payment for you. You can watch a short video from the workshop in Skopje!